I bought OS Landranger Map 25 today: Glen Carron and Glen Affric. Which means I’ve spent hours drooling over mountains, stalker tracks and hill lochs, plotting routes, camping places and the key approaches to some of Scotland’s most remote Munros. In gaelic they sound romantic: Carn nan Gobhar, Sgurr na Lapaidh, An Riabhachan and An Socach. They dominate the high wilderness between Loch Mullardoch and Loch Monar in the heart of the Scottish Highlands, miles from human settlement. If there’s time in our five day hike there’s also Lurg Mhor and Bidean a’ Coire Sheasgaich which stretch above remote Loch Calavie. But the excitement of poring over the map and finally tackling these hills after talking about climbing them for more than 20 years is tempered with a little fear. Exposed ridge walks link some of them and are part of the deal, so I need to overcome the instinct to stay away from huge drops. 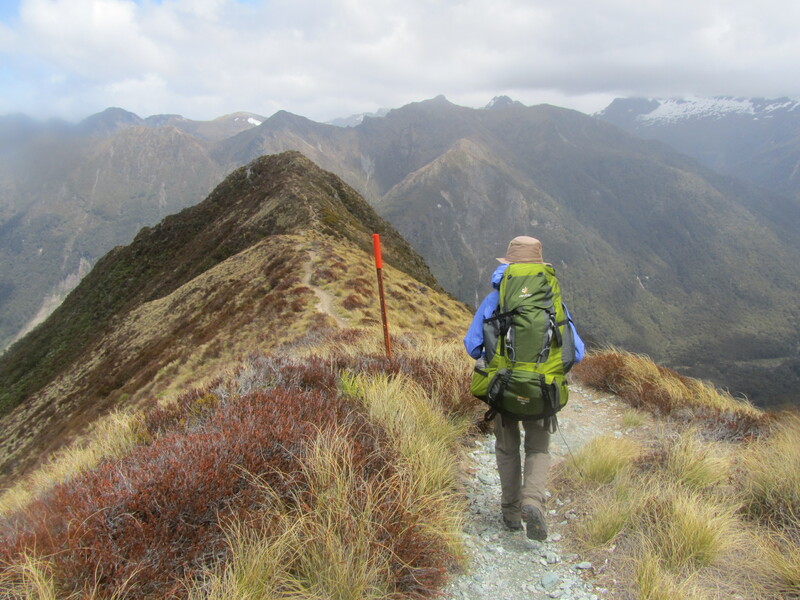 I won’t know how I’ll cope until I get there but (with a lot of teeth gritting) I did succeed in walking New Zealand’s Kepler Track ridge last December – largely because once I’d started the thought of returning over the same ground was too awful to contemplate. Richard Bach, the author of Jonathan Livingston Seagull said: “Argue for your limitations and sure enough they’re yours”. Well, in this year of getting on and doing the things I’ve always said I wanted to do, there’s no place to hide. No excuses. Your writing is honest true to life & yourself it gives to the reader the feeling that you are human you have fears & doubts yet you still burst forth with life…you are what many would call a role model. Praise indeed, but undeserved! I’m glad you can’t see my face up there on that ridge; there was nothing role-moderish about it! Thanks for the comment though. It is very refreshing to find someone honest & unafraid to admit their natural human reactions.